A couple who work together at McDonald's say they have no plans to give up the job despite winning more than £1.3m on the lottery. Emma Cox, 28, and Luke Pittard, 23, went for a celebration burger after picking up their cheque at Cardiff's Millennium Stadium. "It's an enjoyable job. They treat us really well," said Luke. The pair, who have a two-year-old daughter, have been living with their parents, and will start house-hunting. 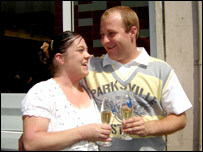 The couple both work in the Pontprennau branch of McDonald's, where they met four years ago. Ms Cox, who lives in Splott, Cardiff, learned they had won last Wednesday's jackpot when she switched on the TV to check the winning numbers on Thursday morning. "I saw the first three numbers and I thought, we've won a tenner, then the next three came up," she said. "I was looking at the ticket thinking, no, it's not real." 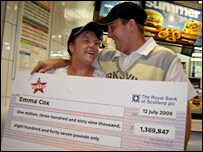 She had been given a clue earlier, however, to the £1,369,847 slice of good fortune. "It's funny because on the day I bought the ticket, I went back to work and there was a money spider on my hand," she said. "So I said to one of the girls that I was going to win the lottery that night - obviously never believing it would happen." When she discovered they had won, she telephoned her partner, who was having a busy morning at work. "I just thought, I haven't got time for this now," he said, and carried on working. The couple, who currently live with their respective parents, plan to start looking for a "nice-sized" house, somewhere in Cardiff. Ms Cox said: "The whole family's on cloud nine and we're looking forward to a nice holiday - possibly a cruise as I've always wanted to go on one - and then we'll start looking for a new house. "Chloe's only two so is a bit young to understand it all really, but I'm sure she'll be suitably spoilt." Ms Cox said she wanted to carry on working to keep "level-headed". Cardiff area manager Marcus Crossman said it was "absolutely fantastic" the couple planned to carry on working at McDonald's. He said everyone was "just gobsmacked" by the win. "We're all really pleased for them," he added.